This isn’t the Shakespeare you read in high school. But, then again, it is. 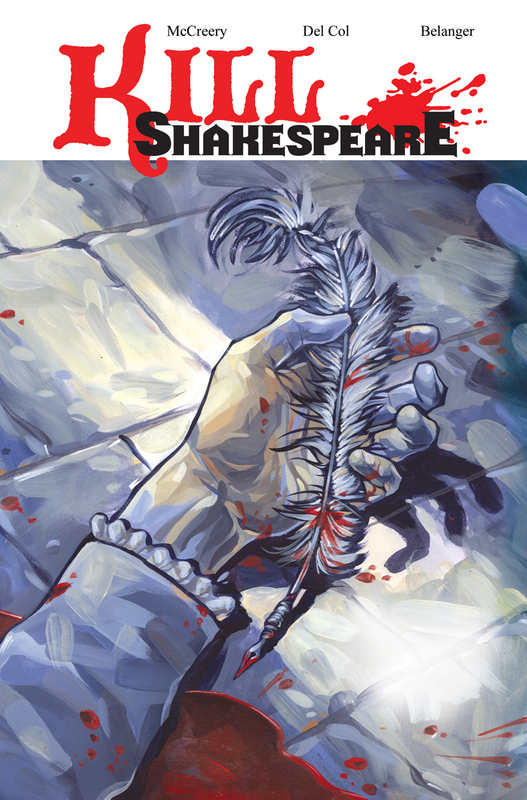 In their series, Kill Shakespeare, co-creators/writers Conor McCreery and Anthony Del Col and artist Andy Belanger have turned the Bard on his head, reimagining the words and worlds of Shakespeare in placing them in a shared universe. For comic book fans, Kill Shakespeare is both a fantastic read, but also a perfect entry point for non-comic fans to check out the medium. 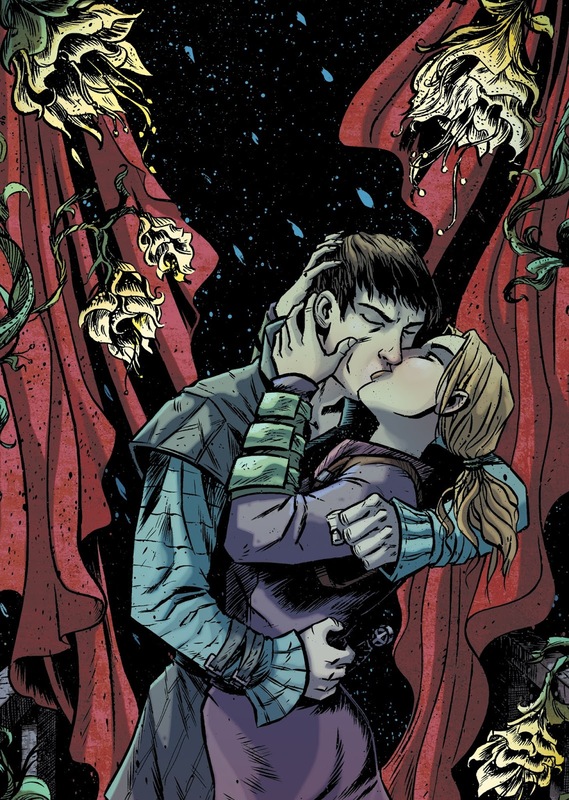 Andy and Conor took some time out of their schedules to discuss their work on the book, as the first hardcover collection, The Backstage Edition, hits retailers and comic book specialty shops. FOG! : How did you guys meet? Conor McCreery: It was quite Shakespearean actually. Anthony and I attended the same small university in South-Western Ontario. We were even in the same program, but we were two years apart and never met while we were actually on campus. Then a couple of years after we’d both graduated my high-school best friend’s little brother (are you following this? ), turned out to be friends with Anthony and told his brother that he thought Anthony and I should meet. So of course I came to that meeting armed. Anthony Del Col: I was told that there was another Wilfrid Laurier (our university) business graduate who was in the film industry. I was shocked, thinking that I was the only biz school grad crazy enough to pursue a career in film and entertainment! So I agreed to meet, figuring that we would either collaborate on something together, or that I would have to kill him. Were you guys looking to collaborate on a project? What was the genesis of Kill Shakespeare? I’m always open to collaboration – I have so many projects these days with co-creators. I love the experience. So, yes, Conor and I hit it off immediately and started to collaborate on some other projects before we came up with the idea for Kill Shakespeare. We were just brainstorming ideas one day and the film “Kill Bill” came up. We talked about how cool that world would be as a video game and one of us joked that it would be even cooler if the Bill in the title was William Shakespeare… and the light bulb went off! It was funny how long the idea stayed with us, but I guess that’s what the good ones do. We worked on a number of projects together, and got a couple of option deals between the two of us, but nothing ever stuck. And then Anthony said “hey, what if it were a comic book…. ?” And the rest, as they say, is nine years of writing and building a brand. You’ve mentioned that once you had the initial concept you weren’t sure the best medium to tell this story in. What made you develop it as a comic? I really liked the contrast of the idea. Shakespeare is, unfortunately, traditionally viewed as very “high brow”, while comics book are, unfortunately, viewed as “low-brow”. So we decided to meet at the midway point and see what would happen. It was great – as soon as we started to put together the concept for comics things started to come to life and really gel in a whole new way. Had either of you written comics professionally before? Did you shop it to publishers? How did IDW get involved? We put together a pitch package, which featured the outline of the series, character designs and sample pages by artist Andy Belanger, marketing ideas, etc., and brought them to the New York Comic-Con in February, 2009. We had one meeting set up in advance and the rest of the weekend we hustled, going up to every publisher and introducing ourselves. By the end of the weekend we have three offers and finalized a deal with IDW a couple months later. All hail the marketing genius of Anthony Del Col! What is your process for co-writing? It changes, but basically we break the story together, argue back and forth, brainstorm, discuss, toss heretical notions at each other, and then we divide up the issues. One guy does a beat sheet and the drafts while the other guy story edits. Then at the very end we usually do a dialogue pass on the other guys work. Anthony tends to unknot my sometimes too-dense prose, and I like to get in there and jazz stuff up for him. It’s a really good balance. Were either of you big Shakespeare fans prior to beginning the project? What kind of research did you do prior to deciding on which characters you wanted to utilize? I just did a talk at the Globe Theatre in London and started out by confessing that I don’t have an English degree or a Masters in Shakespeare, but I DO have a passion for the Bard that was accumulated over the years. I had some good teachers in high school (hello, Mr. Cribbs!) but most importantly my sister (who has the Master’s degree in English Lit) introduced me to a lot of the Bard’s plays over the years. So I owe her a lot! My family didn’t make pilgrimages like the Del Col’s, but my Mum was an English major so I had a nice hardcover copy of Shakespeare’s plays as a kid, with about 4-pt font. But what made it come alive for me was a great English teacher (thanks Mrs. Thomson!). She took us to see The Tempest at Stratford in Ontario and watching Caliban leap around the stage made my little 13-year old Marvel-loving brain think “holy crap, he’s like Wolverine!” And that was it. I was in. Were there any characters that you knew from the beginning that you knew you wanted to use? Hamlet was the most difficult. He wasn’t a character in the original draft of the work – instead, it was someone from today’s world that finds a portal back into this land with all of Shakespeare’s characters. But as we focused more on the story we realized that it wouldn’t be right to not include Hamlet, who I believe is one of the greatest characters ever created. How did Andy Belanger get involved with the project? We cast out a net to look for artists and Andy was one of the first people we talked to. We sat down with him and immediately pounded his hand on the table, saying that he’s always wanted to draw the Macbeths. His enthusiasm was amazing and we knew that we’d have a lot of fun working with him! We’re so lucky we got him. Andy’s visual style ends up making so much of Kill Shakespeare work. I don’t think the book could be anything like what it is, in terms of the “anything goes” vibe, without Andy. It’s so satisfying to see the success he’s having with Southern Cross because we know how under-rated he is. 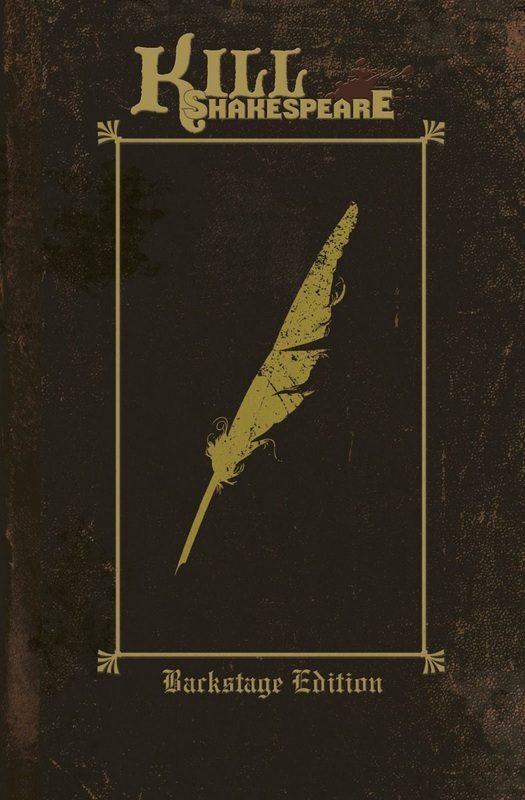 This new edition contains the first twelve issue of the story. Looking back on it now, are there any storytelling elements that you would have done differently? I re-read it now and am relatively happy. I mean it was our first comic and I think it holds up extremely well on that end, but for sure I’d change stuff. I’d pare down some of the dialogue and I think the story structure could be improved. We sort of lose Hamlet’s Father there. I kinda like some of the weirdness of it, the lack of structure means it can go anywhere. But it could have kept that and been more traditionally put together. More like volumes 3 and 4. Do you have a favorite moment in the series? To me the essence of Kill Shakespeare is our reverse balcony scene, in which Juliet climbs the balcony to visit Hamlet. It’s a moment where we take well-known characters and a well-known moment and put our own original spin on it, creating a new story in the process. It was the first scene that came to me when we were brainstorming and it’s still stuck as that defining moment. What Shakespeare character is your favorite and which Shakespeare character haven’t you written that you’d like to? My fave? Ease up on the impossible questions, Blitz! In OUR world I love Falstaff and Iago. From the canon, Othello is one of my favourites as is Imogen from Cymbeline. As for one I still want to write? Kat from Taming of the Shrew is one we’re both excited about. I’d also like to spend some time with Claudius, Gertrude and Ophelia. I mean Hammy’s GOTTA get back home EVENTUALLY right? As we’ve worked on the comic, the stage play, and then some other offshoots, Hamlet was emerged more and more as the most fascinating character I’ve ever read (and written). He’s just a bundle of contradictions, insecurities and passions. As for other characters we haven’t tackled yet, I can’t wait to sink my teeth into Beatrice and Benedick from Much Ado About Nothing (the ultimate romantic comedy sparring partners) as well as King Lear and Titus Andronicus (an elder statesman and a warrior, but both slightly mad). 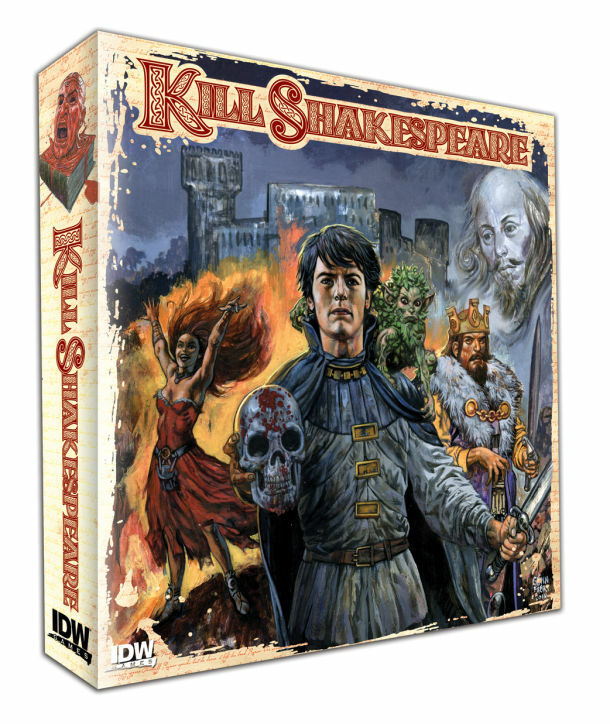 Kill Shakespeare has been an app, a board game, adapted into a play and more. Where would you like to see the property develop? Ideally as many products as possible. Television would be amazing and my dream is to one day see action figures of our characters as well as a Broadway musical. Jazz hands! If Anthony doesn’t get his Broadway musical version I will have failed as a creative partner. In 25 words or less, why should someone check out Kill Shakespeare? Juliet is leading a rebellion. Hamlet makes a decision, finally. It’s a fun adventure with drama, violence, love, lust, comedy, magic, double-crossing and cross-dressing. All the stuff that makes storytelling so grand. I’m so busy these days writing that it’s unfortunately tough to find time to read/watch/experience as much as I’d like to. I’m enjoying the renaissance of podcast storytelling these days (like Serial, Startup, etc. ), and love that it feels like a throwback to the classic radio drama days of the ‘30s and ‘40s. TV: Unbreakable Kimmy Schmidt, G.O.T. (‘natch), Louie, and Parks and Rec (so sad that it’s over. ), The Americans. Music: Mother Mother, Blur, and kinda just letting my iPod reacquaint me with my old collection. Oh you caught us at JUST the wrong time. We have some cool stuff on the go, but we can’t say anything… yet. Kill Shakespeare: The Backstage Edition collects the original 12-issue run of the award-winning series in a gorgeous 400-page hardcover tome that features never-before- seen artwork, a new back-up story and notes from series artist, Andy Belanger making it the definitive edition for fans of the series. KILL SHAKESPEARE's end draws nigh -- FOG! interviews its creators, Anthony Del Col & Conor McCreery. FOG! Chats With Chris Gore About Saving ‘Film Threat’!